Healing ADD – DVDs by Daniel G. Amen, M.D. – Discount! by Daniel G. Amen M.D. Information is power. Here’s a simple, easy to understand explanation of Attention Deficit Disorder (ADD). Discover the biological basis of this disorder. Learn about the broad range of strategies and prescriptions for overcoming the associated problems. Use the proprietary Amen Clinic checklists included in this publication to help identify when ADD is present. Attention Deficit Disorder (ADD) is a national health crisis that continues to grow—yet it remains one of the most misunderstood and incorrectly treated illnesses today. 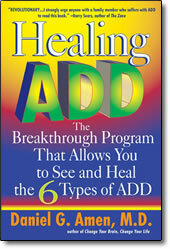 Now, using breakthrough diagnoxtic techniques Dr. Daniel Amen has discovered that there are six distinct types of ADD, each requiring a different treatment. Based on 18 years of clinical experience with more than 6,000 ADD patients, Dr. Amen’s brain enhancement program offers advice on how to treat each of the six types of ADD. Effective treatments include diet, exercise, medications, cognative reprogramming, self hypnosis, biofeedbac, supplements, behavioral interventions and more. Parenting, family and school strategies are also included, along with sleeping and thinking-style disorder-management. Dr. Amen’s revolutionary approach provides a treatment program that can lead sufferers of ADD to a normal, peaceful, and fully functional life. This practical book brings a new level of understanding to this often difficult-to-diagnose and frequently misunderstood disorder. Aside from his clinical perspective, as the parent of 3 children who have ADD, Dr. Amen knows this disorder inside and out. He has used the principles in this book to guide the treatment of his patients and to help his own family. Sufferers from ADD often say, “The harder I tray, the worse it gets.” Now, finally, Dr. Amen tells them how to get well. This information will help you, too!